Undrafted rookie cornerback Holton (Hollywood) Hill was among the lesser-known Vikings who stepped up Sunday as the latest round of injuries sidelined All-Pro Xavier Rhodes and others. 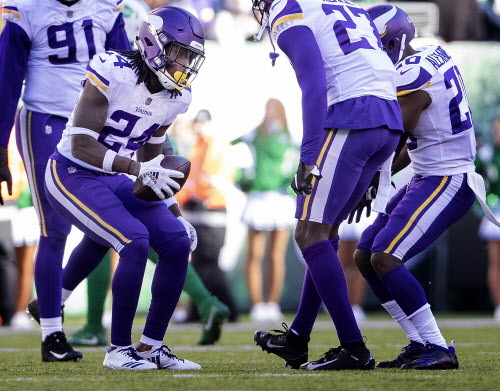 With Mike Hughes lost for the season and the Vikings’ cornerback depth having already taken a hit before Sunday’s game against the Jets, undrafted rookie Holton Hill figured to have a bigger role on defense and special teams. He was asked to do even more in the fourth quarter against the Jets, when Xavier Rhodes had to be helped off the field after spraining his left ankle. The Vikings installed Hill at Rhodes’ right cornerback spot, and on his first play from scrimmage, he intercepted an overthrown pass that Jets quarterback Sam Darnold had intended for Andre Roberts. Hill, who has played 30 snaps on special teams and returned two kickoffs, got 18 more on defense in his busiest day in the NFL so far. As the Vikings prepare for the 5-1 Saints and future Hall of Famer Drew Brees, they’ll have to wait and see how many of their injured defenders they’ll get back before Sunday night’s game at U.S. Bank Stadium. Nose tackle Linval Joseph didn’t play on Sunday, and defensive end Everson Griffen remains away from the team. In addition to Rhodes’ injury, linebacker Anthony Barr left with a strained hamstring on Sunday. All told, by the end of Sunday’s game, the Vikings were missing four defenders who have made it to a combined 10 Pro Bowls for them. If their defensive depth will continue to be tested, they’ll hope for their young players to respond the way Hill did Sunday. –The Vikings’ run game, for the second week in a row, made the difference in the second half of a win. After gaining only 15 yards on 10 first-half run attempts, as their makeshift offensive line struggled to move the Jets’ front, the Vikings found their stride in the second half, gaining 73 yards on 14 attempts, including their touchdown drive where Roc Thomas and Latavius Murray combined for 51 yards. After a Rashod Hill holding penalty put the Vikings in a 1st-and-20 situation, they lined up with three receivers to the right. Thomas gained 23 yards on an outside run to the left, behind a strong initial block from Danny Isidora as Pat Elflein and Mike Remmers walled off defenders. Then, Murray followed a block from Remmers before making a jump cut back inside on a zone run, racing 38 yards for a touchdown. –The Jets sacked Kirk Cousins once and hit him seven times on his 41 dropbacks, which represented a better day for the Vikings in pass protection than some of their recent efforts. The quarterback had to make a fair number of throws under duress — he was hit as he completed a 13-yarder to Adam Thielen in the third quarter, for the first third-down conversion of the day for either team — but the Vikings were also able to catch the Jets on their blitzes several times, like on Murray’s 38-yard touchdown run, when the running back found open space up the middle as the Jets blitzed off both edges. Cousins had three passes batted down, including one that could have been intercepted in the second half. –While the Jets had four plays of 20 yards or more, only two came before the Vikings had built a 17-point lead. Sam Darnold found Trenton Cannon for 35 yards on a wheel route past linebacker Eric Kendricks, and hit Robby Anderson for 25 on the next play, as the Jets’ closely-spaced crossing routes caused a collision between Rhodes and Trae Waynes that left Waynes holding his right arm. –The wind at MetLife Stadium was a significant factor all day, particularly for the Vikings’ specialists. As punter Matt Wile dropped the ball to kick it away, he said he had to contend with the wind blowing it off-course. And Dan Bailey’s 42-yard field goal before halftime started down the middle, before a gust of wind sent it wide left. Bailey, a veteran of games at MetLife Stadium from his time kicking for the Cowboys against the Giants, said the wind affected things more on Sunday than in any game he could remember.